Rectifire’s Extended Choke Tubes are designed and manufactured in our facility with exceptional quality to our standards that will exceed all of your expectations. We have over 55 combined years of design and manufacturing expertise that will be an advantage for you when you purchase our products. 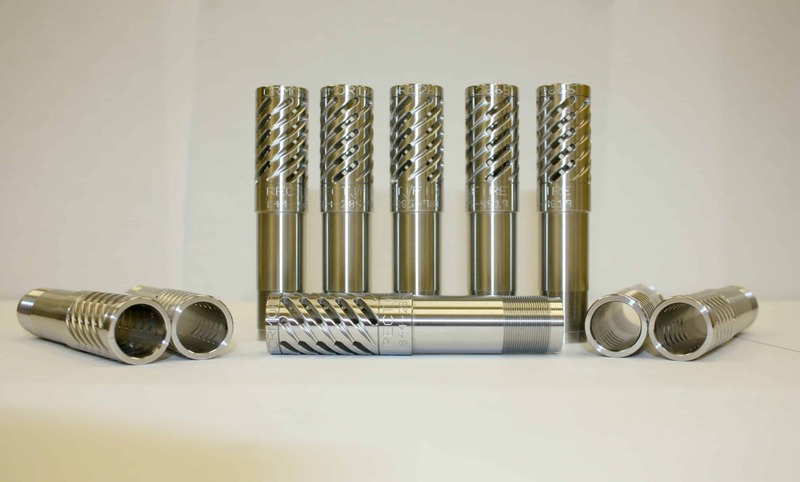 All of our chokes are produced on CNC computer controlled equipment to precise tolerances that provide our customers with continued success while “on the hunt” or “competitive shooting” as well. Rectifire guarantees our customers will receive the highest quality available. Rectifire’s Chokes are manufactured from 17-4 stainless steel with A conical-parallel internal design. All of our testing has proven this to be the superior design to date. The extended portion of our chokes have an exclusive “Rectifire” design with helical slotted ports that will retain the shot wad for better shot patterns, reduce recoil and help you “Stay-On-Target”. All Cyclone Chokes will extend 2″ out of the barrel. All chokes are constricted based on the Basic Muzzle Bore (B-M-B) of the firearm. Rectifire offers 18 choke sizes for each of the OEM’s Choke Tube System(s) of their firearm(s). Starting at .640 thru B-M-B, and with A few exceptions, we offer the -.005 Choke (Beretta/Benelli Mobil Choke, etc.). Rectifire’s standard constriction is listed below. Rectifire currently offers 4 finishes for our chokes: 1. Natural, and 2. Black Oxide are stocked here at Rectifire. 3. Cerakote HT-Black, and 4. Camo may require additional processing time as these chokes may not be in stock. The detailed information provided on the part # page of each OEM’s choke tube system(s) will help get you started with the right choke for your hunting-shooting adventure. Rectifire has identified the best choice for our chokes based on data collected from testing our chokes in our firearms. You may get better results by changing choke size, shell load or pellet size (occasionally, it may be necessary to change firearms). Rectifire strongly suggests that you pattern your firearm with our chokes to find the best combination to ensure your hunting-shooting success.